UCSB Arts & Lectures Brings Cello Master to S.B. 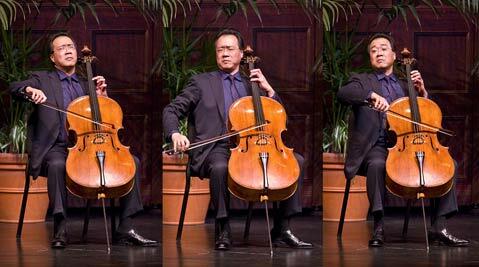 Yo-Yo Ma has been a favorite artist of UCSB's Arts & Lectures for nearly 30 years. Everything you’ve heard about Yo-Yo Ma is true. If he is not the greatest living musician, I don’t know who is. It’s hard to imagine anyone outdoing him in a solo recital, and it’s even harder to imagine anyone who would not be charmed by the immense generosity and charisma of his live performance. Ma’s Monday night concert began early and covered familiar ground, albeit in a wholly fresh and thoroughly satisfying way. The revered Ma took as his text three of J.S. Bach’s suites for cello, the true holy scripture of string players. This program included the Suite No. 2 in D Minor, BWV 1008, the Suite No. 3 in C Major, BWV 1009, and, after intermission, the crowning glory of the series, Suite No. 6 in D Major, BWV 1012. Ma has expressed his admiration for pioneering cellist Pablo Casals in terms of the legendary musician’s ability to “believe in every note,” and this observation was one of the first things that came to mind as I watched Ma play these works. The Bach suites are organized around an incrementally expanding set of exercises-in other words, they gradually get more complex. The second and third suites are hypnotic, and draw the audience into a meditative state. Suite No. 6 is expansive, and by the time its glorious penultimate movement, the “Gavotte,” comes along, it can seem as though you’re hearing the overtones of everything in creation-the true music of the spheres. Every cellist who takes on the Bach suites sets out to give an account that will be remembered with distinction, something that contains his or her unique musical signature. For Ma, this has happened more than once, as he has recorded the suites in two distinct phases of his career. This time, the stamp was one of nonlinear, contrapuntal universality. His playing was the musical equivalent of Leonardo da Vinci’s famous image of “Vitruvian Man,” the perfectly proportioned gentleman who stands, arms outstretched, in the center of a circle, providing the ultimate source of ideal proportions. When Ma played Bach, he seemed to occupy a similar center, and to imply a corresponding ideal for music. This universality may be an illusion, but what an illusion it is.